LASS UNS TANZEN! Let’s Dance, Dallas Vintage Shop will provide the Oktoberfest Traditional Costumes, German Polka Dancer Attire and Historical Oktoberfest & German Folk Festival Costumes We have the Dallas, DFW and North Texas Areas largest collection of German Fest and Oktoberfest Classic Festive Attire. You will find German Maiden High Quality Corsets & Dirndls, Peasant Blouses, Long Blond & Long Braided Wigs, Festival Aprons, Long or Mid Length Skits & Petticoats, Character Shoes, Tall Knee Socks and more Oktoberfest Folk Costumes & Garb with all the necessary accessories you will need to create your Tirolean, Bavarian, Alpine, Austrian and other Oktoberfest Traditional Ethnic and Folkloric Style Outfits. Create your own Oktoberfest Flavor. We have Supreme Oktoberfest Garb, Median Priced Traditional German Attire, Theatrical & Historical German Character Outfits, and Economy Costumes for Theme Parties and School Projects. 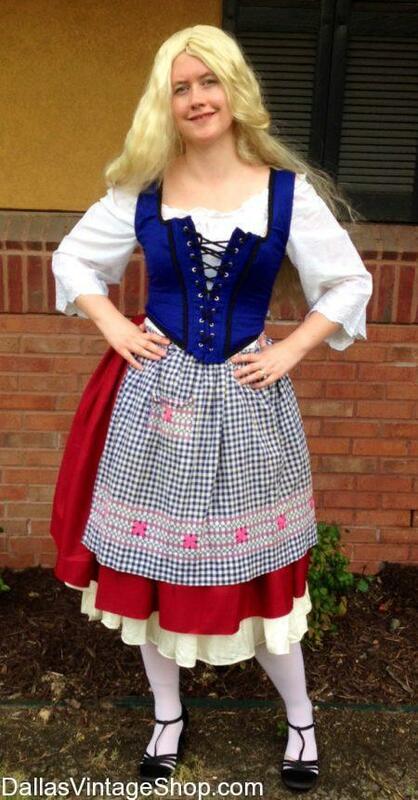 We keep our German and other International Traditional Costumes & Oktoberfest Outfits well stock all year round. We are your One Stop German & Oktoberfest Costume Shop.